There is a new(ish) Persian place on the block in north London. Well I knew of it but only got round to visiting it for the first time a month ago. And I returned to it for the second time yesterday. Shayan serves typical Persian grub like Chelow Kebabs (Iran's national dish) with rice and butter, grilled tomatoes as well as other variations of grilled lamb and chicken. 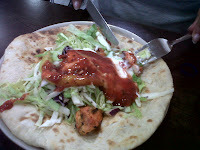 I went straight for my favourite, the Chelow Kebab which costs the bargainous sum of £5.50. My mum ordered hers with naan bread. We also ordered the Salad Shirazi (finely sliced cucumber, tomatoes, onions, tomatoes and herbs). It's such a simple marriage yet so satisfying. The kebabs were tender and grilled perfectly, and the rice melted in the mouth. Service was super-fast though the atmosphere was somewhat lacking (the restaurant was empty on Saturday night). This was disheartening and worrying, as the food is wonderful but the fear a local gem might close looms. I really hope this won't be the case as Persian restaurants for me are usually quite far away or difficult to travel to. Shayan has a take-away and delivery branch in Barnet too (154 Lancaster Road, Barnet, EN4 8AL, Telephone: 020 8441 0222). 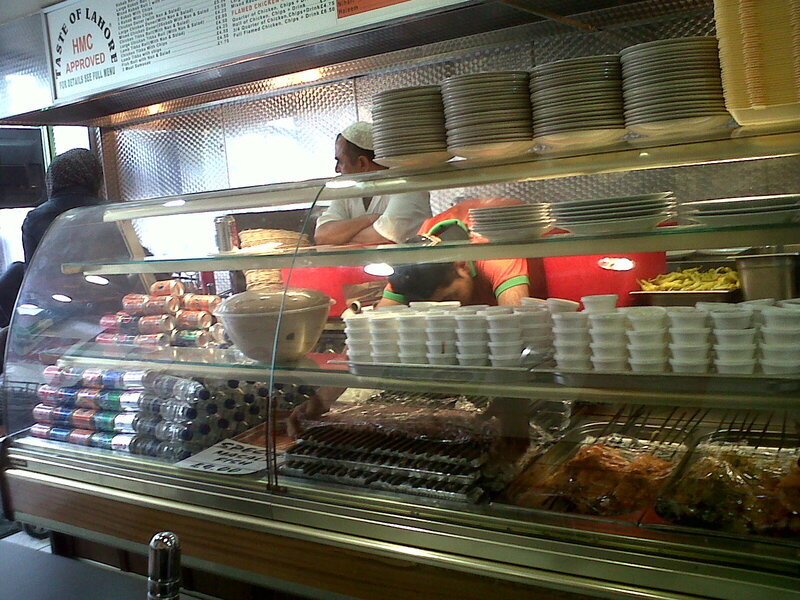 The Edgware restaurant also does take-aways. Car: Pay & Display Monday to Saturday from 8:00am - 6:30pm, free after 6:30pm, Sundays and Bank Holidays. 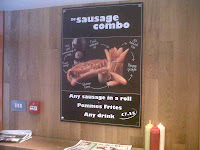 The Bratwurst is to Germany, what the kebab is to Turkey - or so says my German friend. He also says that Germans have only just realised that the humble Bratwurst could be popular outside Germany which is why we have recently seen a rise in the number of Bratwurst vendors in London's street food sceene. 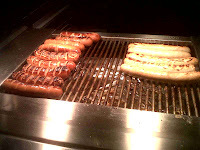 A Bratwurst is a type of German sasague, and the key to its popularity lies in the quality of the meat. 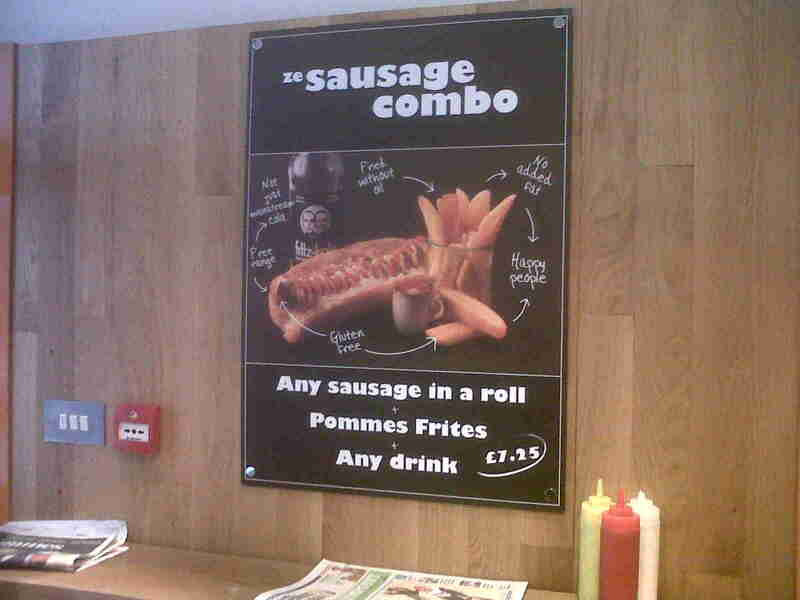 In the UK a sausage only has to have a minimum of 30% meat. 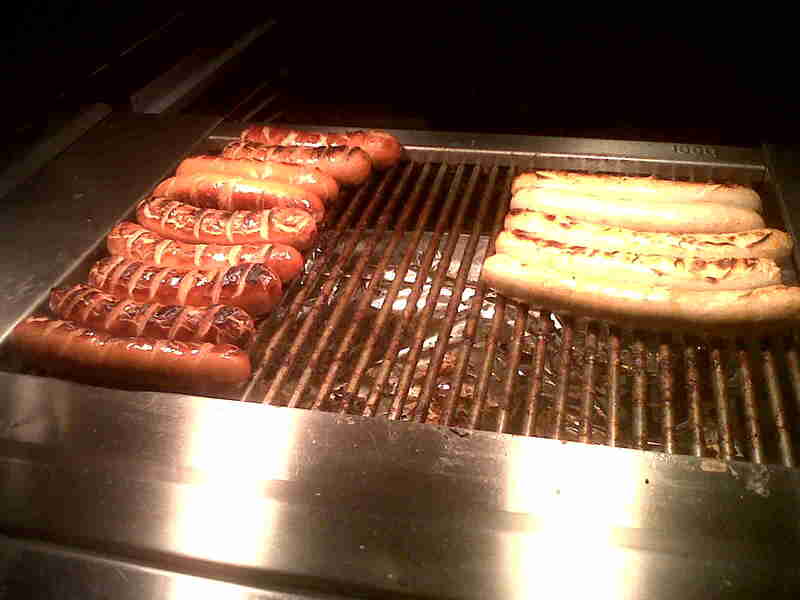 In Germany a sausage is legaly required to have a minimum of 80% meat. This results not only in Greman sausages being better quality and better tasting, but also better for you, as unlike their British counterparts they are not pumped full of fat and bulking agents. Wurst (German for sauagse) come in 3 types, Bratwurst, Currywurst and Brockwurst. Bratwurst is the most common type of wurst and is usualy made of pork or beef, panfried or grilled and served in a bun like a hot dog. Where ever you go in Germany you will find bratwurst being sold from market stalls and kiosks making it Germany's favorite street food. You can find all three types of wurst at Herman ze German topped with sauerkraut and served with baked fries and German soft drinks. All of the wurst served here are imported from the Black Forrest, so you can be sure you are experiencing the authenic taste of Germany. In fact the wurst sold here are so good that the German ex-pats of London flock here at weekends for an authentic taste of home. When I found myself visiting GRAB Thai street kitchen five times in a month, I knew I had to blog about it. The food is THAT good. 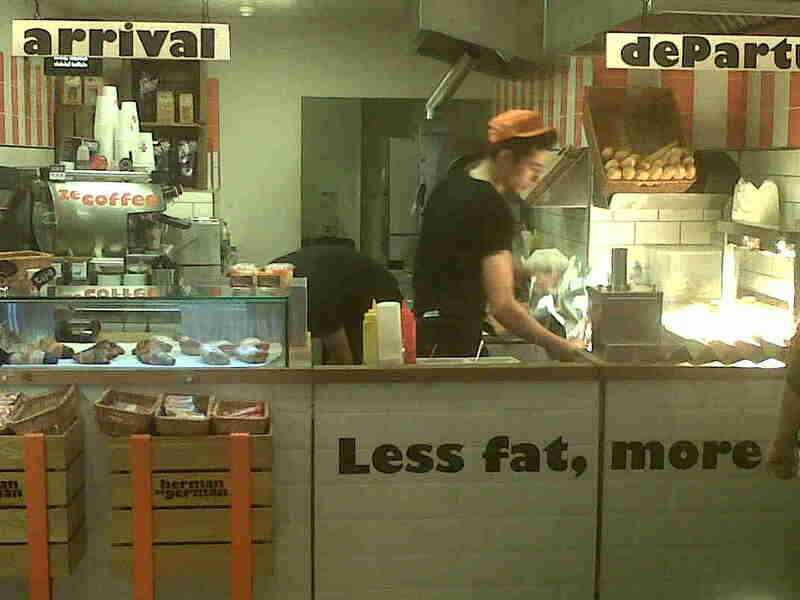 With it's no nonsense industrial interior, friendly staff and delicious food, GRAB is a hot favoirte with the office workers of Old Street. There is always a que at lunch time - but thanks to the super efficent service you never have to wait to long for your delicious lunch. 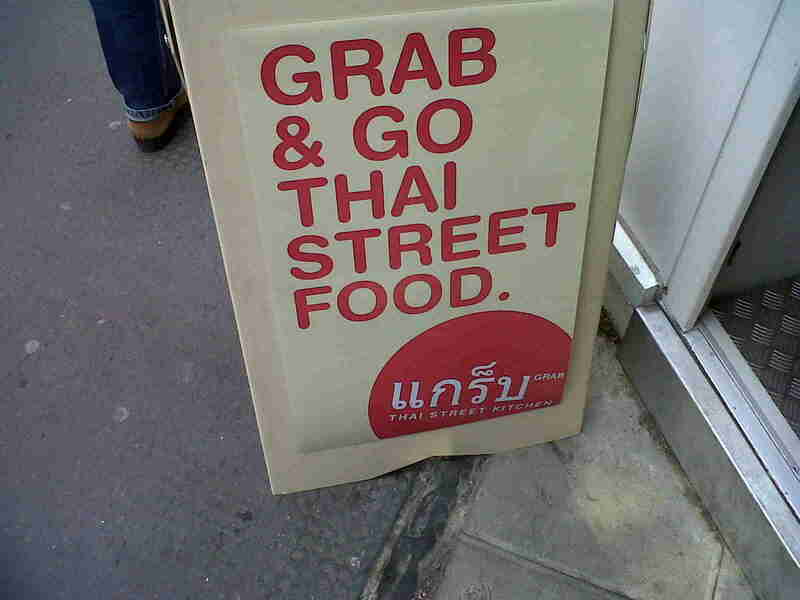 GRAB serves all of your standard Thai dishes including; Green and Red Curries, Pad Thai, Tom Yam soup and sweet treats like mango and sticky rice. But my absolute favorite dish is the newly introduced Massaman curry chicken, a richly flavored combination of Chicken and potatoes cooked in massaman curry paste with onions, carrots, peanuts and bay leaves, topped with fried shallots. For those who like their breakfast less stodgy than a full English, get to GRAB before 10.30am to try the traditional Thai breakfast dish Congee, which is a savoury rice porridge with fresh ginger, coriander, spring onion and a topping of either Chinese mushroom, minced tiger prawn or shredded flame grilled chicken. Once you've tried the food at GRAB I guarantee you'll return again and again, so make sure you pick up a loyalty card at the till! Car: There is no car parking in the area. If you fancy Italian for dinner, there are hundreds of restaurants and take-aways in London who can satisfy your Pizza and Pasta cravings. But how many of them aren't part of a national (or international) chain? How many of them can give you that little bit extra that makes you feel like you've eaten Italian and not just gone for a pizza? Taromina (named after a small town in Sicily) is one of those few Italian restaurants in London who can give you a genuine Italian dining experience. It is, in fact, the kind of restaurant this blog is all about, small, family run and so authentic that actual Italians dine there. We were delighted when we found this lovely little restaurant down a back street in Bayswater. Ok, so some people might call the Taverna style décor cheesy, but I liked the splash of rural Italy in the middle of West London. We visited Taromina on a Thursday night and the restaurant was pleasantly busy with European tourists for nearby hotels and Italian families. When I couldn’t decide what to choose form the extensive menu our waiter suggested the Tortelloni crema e Funghi - spinach and ricotta stuffed pasta in a cream and mushroom sauce and the Lasagne al Forno. Both were excellent, the Tortolloni was rich and creamy and the Lasagna was fresh from the oven. For desert we had the Floranmtiuna - vanilla ice cream swirled with chocolate and sprinkled with brown sugar and topped with amoretti biscuits and the home made Tirmasu. The Ice cream looked amazing but didn’t live upto expectations (it tasted like supermarket own brand) but the Tirmasu was excellent. Over all we had a lovely meal, (but let's be honest - it's pretty hard to screw up pasta) but the lovely waiting staff were what made this place special, I wouldn’t hesitate to go back to Taromina again. 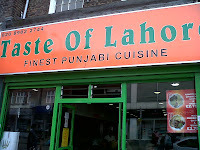 For years I have passed the Taste of Lahore with only a vague acknowledgement of its existence. On the odd occasion I glanced through the window the place was always busy which seemed odd for somewhere that on first glance seems like a down market kebab shop. 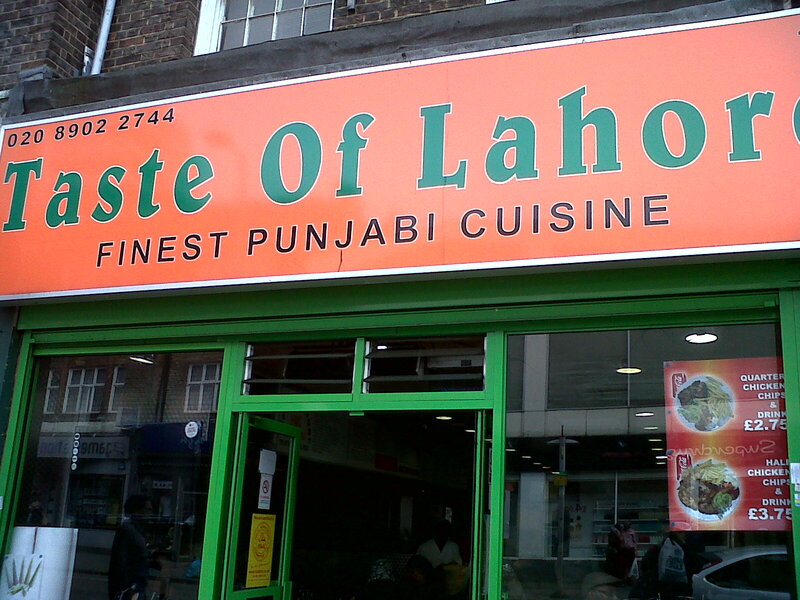 Then, one Saturday, when every other eatery on Wembley High Street was full to bursting with football fans on their way to the stadium, Taste of Lahore became my only option for lunch. To my delight I discovered that this Asian greasy spoon serves more than just kebabs and chips. 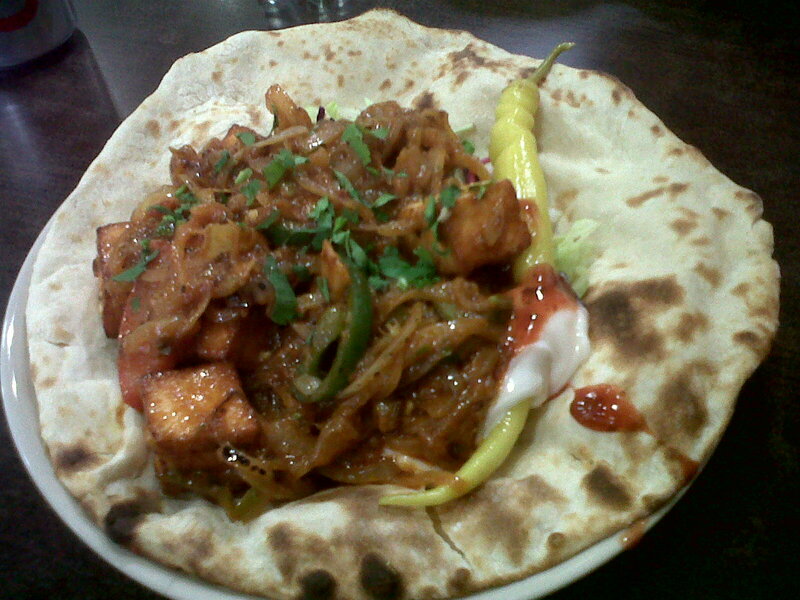 The menu includes a wide variety of meat, veg and fish curries, Tandoori dishes, biriyanis, rotis, naans and prathas. Which explains its popularity with the local Asian community. 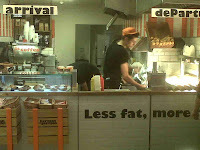 The food served here is not just quick and cheap, it's also extremely tasty. We were shown to a table by a waiter in a bright orange and green t-shirt and ordered the Paneer (Pakistani type of cheese) and the chicken Tika (both served with naan and salad) from the snacks section of the menu and when they arrived we were plesantly surprised to find that each dish was enough for a main course. Both dishes were excellent and the Paneer was so spicy it cleared my sinuses (I probably should have said no to the hot sauce). We tried to visit again a few weeks alter to sample a few more dishes but they were so busy there was que for tables, so we left and went to Subway for a disappointing sandwich which made us wish we'd been a little more patient. Around the world in London restaurants by Helen is licensed under a Creative Commons Attribution-Non-Commercial-No Derivative Works 2.0 UK: England & Wales License.